It’s difficult to develop intuition for radiometric units. Radiant power, radiant intensity, irradiance, radiance—on first encountering these terms and their associated mathematical definitions, anyone’s legs would go wobbly! Building technical fluency with these concepts requires one to sit down and practice working with the math directly, and nothing can substitute for that—but reasoning can be greatly accelerated by having some good mental images that capture the essence of things. One thing all the various radiometric units have in common is that they’re densities of various sorts. A density is a kind of unit that quantifies how thinly or thickly some kind of “stuff” is spread across some domain. It shows up all over the place in physics: mass density, charge density, number density, energy density, probability density, and so on. A simple (and delicious!) mental image that helps understand the concept of a density is buttered toast. The butter is whatever “stuff” we’re spreading, and the toast is the domain it’s spread over. The density is the thickness of the butter at each point on the toast. The butter can be thicker in some places, thinner in others, just as a mathematical density can be more or less concentrated at different points. If you integrate the butter density—the thickness—over the area of the toast, you recover the original volume of butter. Although it’s a bit of a stretch, you can even picture a delta distribution in the buttered-toast model: imagine the entirety of the butter concentrated above a single point on the toast. It would have to have a very high thickness—it would have to be a very tall, thin column of butter! 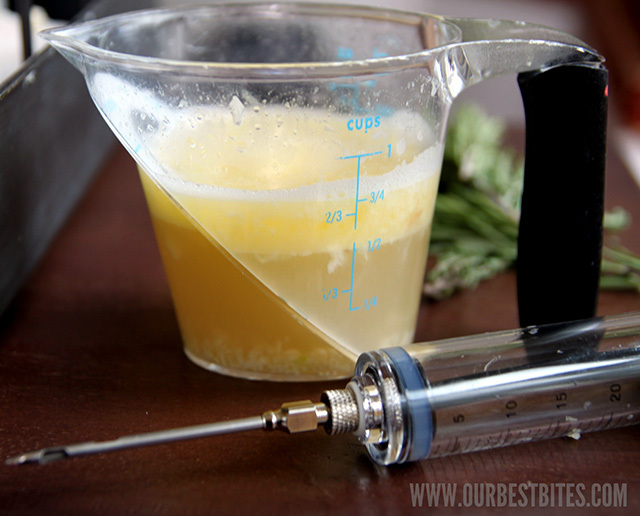 (Imagine the butter contained in a long, thin straw or a long syringe or something, if it helps.) However, the total amount of butter has not changed. This is a common enough mental picture, and maybe you already use some variant of it in your own thinking about probabilities and other things. The same sort of image can immediately be applied to radiometric units. Here in radiometry, the butter—the “stuff” we’re going to be spreading—is radiant power (also called flux). It’s already a bit weird to be thinking of this as “stuff”, since it’s not energy—which really is a kind of stuff that you could have a fixed amount of—but power, which actually describes the rate at which energy is being emitted, absorbed, or transferred over time! Since light is ephemeral and doesn’t tend to stay in one place like a well-behaved substance, it’s not so useful for us to think directly about the energy of the light. But in a situation where a bunch of light sources have been emitting at fixed rates for awhile, the flow of energy through the scene will settle down to a steady state, in which emission and absorption are balanced. Under these circumstances, we can think of the energy flow as a kind of “stuff” that can be spread thickly or thinly—there can be more light flowing through some areas and less through others. That flow is measured by radiant power (aka flux), which quantifies the “total amount of light” emitted by a source, or flowing into or out of some finite region. Now that we’ve established that radiant power is butter, irradiance is simple! It’s just power received or emitted per unit area, which corresponds directly to the image of buttered toast we’ve been talking about. 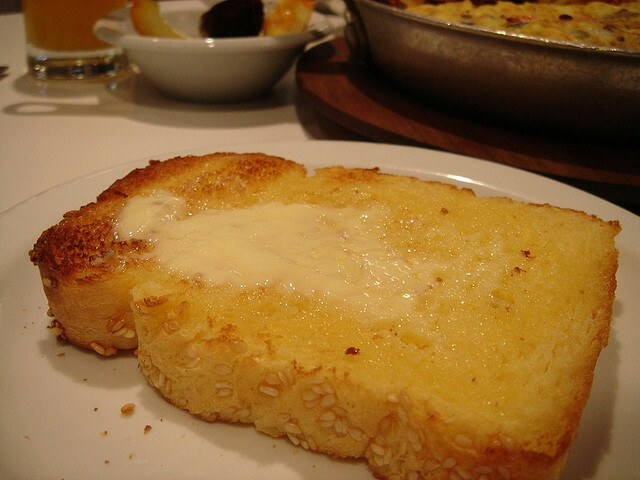 The area of the toast is the surface area of the light-emitting or light-receiving object, and the irradiance is the thickness of spread butter. Just as integrating the butter thickness over the toast area gives you the total volume of butter, integrating irradiance over surface area gives you the total radiant power flowing through that surface. One way in which light is not like butter is that light is always on the move, and different amounts of light moving in different directions can coexist in the same space. To get a grip on the directional distribution of light, we have radiometric units that are densities in the set of directions in 3D. These densities are just like those we’ve discussed above, but the domain of the density is now solid angle: the area of the sphere of directions, rather than a physical surface area. So we need to switch to spherical toast. Unfortunately, spherical toast doesn’t seem to exist yet (I checked), so we’ll just have to make do with these loukoumades instead. (Woe is us.) 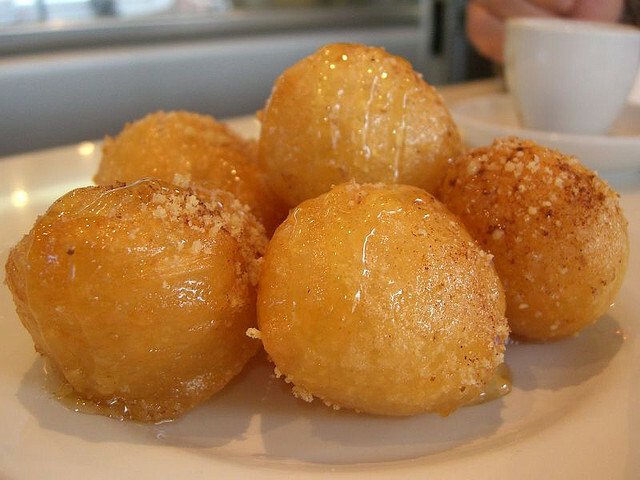 You can keep imagining we’re spreading butter on spherical toast, or you can imagine spreading syrup on loukoumades instead! Radiant intensity is the density of radiant power over solid angle, expressing how the power emitted by a point-light (say) is distributed over all the directions in which the light can be emitted. Since radiant power is syrup, and the loukoumas is the sphere of directions, radiant intensity is the thickness of syrup coating the loukoumas’ surface. Integrating the syrup thickness over the loukoumas area gives the total volume of syrup, much like integrating radiant intensity over solid angle gives the total power. Let’s be honest here: radiance is pretty annoying. On the one hand, it’s by far the most commonly-used of all the radiometric units, since radiance is what rays carry. (“Ray” is right there in the name, “ray”-diance!) However, radiance is particularly challenging to understand because its definition involves two different domains at once: radiance measures how densely radiant power is distributed over both area (cross-sectional to the ray) and the set of directions. To get a mental picture of radiance, we therefore have to combine the previous pictures we had for irradiance and radiant intensity. Imagine a surface, like that of a piece of toast, but covered with millions of microscopic loukoumades, each one representing the sphere of directions around a single point on the toast. Or, for an opaque toast, you may only care about the directions in the normal hemisphere, in which case gulab jamun may be a more fitting image. So, we’ve got countless tiny gulab jamun all over our toast, each one delectably covered in syrup. 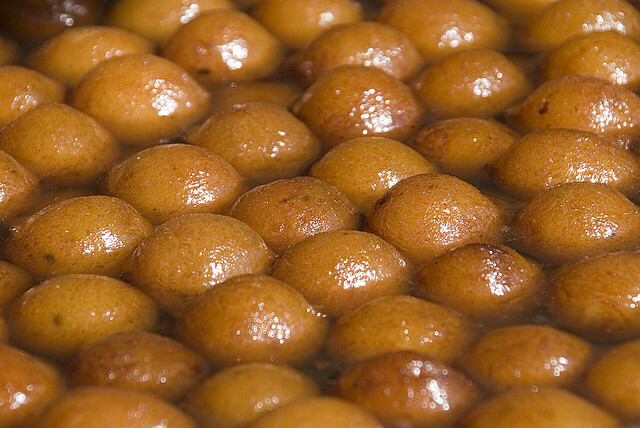 As before, the syrup is the radiant power incoming or outgoing from the toast, and its thickness on the tiny gulab jamun is the radiance—which can vary from place to place on the toast, and also from direction to direction on the gulab jamun spheres. The irradiance can be obtained by integrating over the hemisphere, flattening out each gulab jamun and letting its quantity of syrup lay directly on the toast. From there, the total radiant power can be obtained (as before) by integrating over the toast area, adding up the entire volume of syrup. I hope all this has made at least a little sense, and that visualizing images like these helps you get a little more intuitive grasp on what all the various radiometric units mean, and what’s going on in rendering equations. Just remember: light is butter. Or syrup. Or both; I mean, they get all mixed together on my pancakes anyway. Now, if you’ll excuse me, I’m hungry!